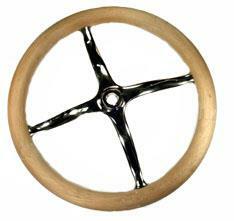 Steering wheel with smooth wood rim and chrome spider. 14-1/2 o.d., 12” i.d. rim. Rim is made of unfinished mahogany.